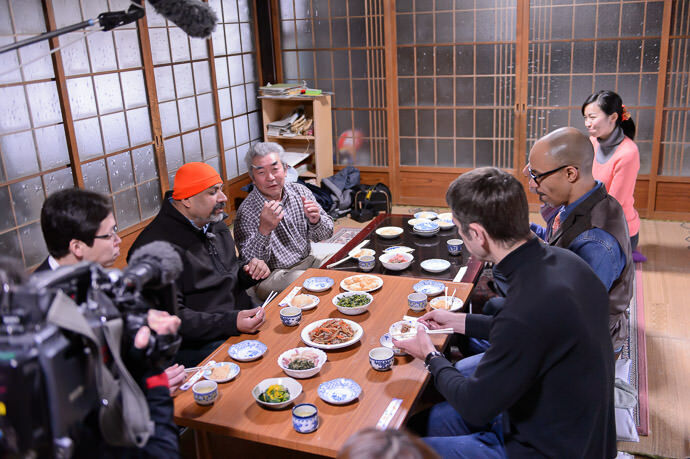 I recently had a fun experience to be part of filming a short TV segment scheduled to be shown next week... it's scheduled to air on Kansai TV on Tuesday the 24th, during a bigger news program, sometime between 17:20 and 17:45. 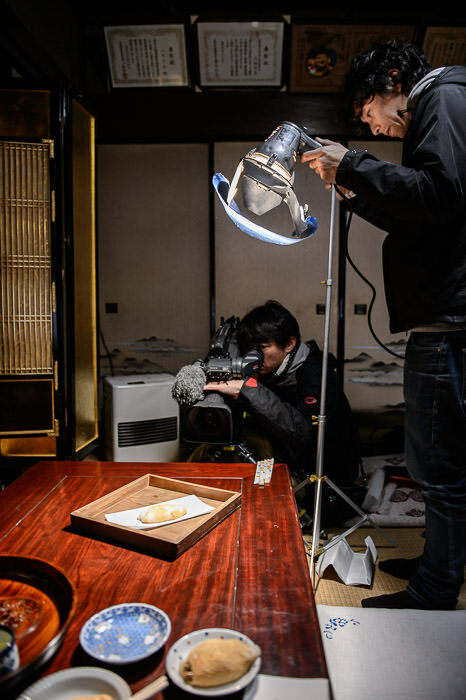 The segment was part of a larger piece on Shiga Prefecture (the “state” next to Kyoto) and what it has to offer, and why it's not as popular among foreign tourists as Kyoto. The TV station was working with Tour du Lac Biwa, a tour company that provides day excursions into Shiga, in English, doing all kinds of really interesting off-the-beaten-path things. I worked with the tour company prior to their starting business, as a “test foreigner”, to help them get their tours up to speed. I got to experience (and photograph) all kinds of fun things, and I was in their Rolodex when they needed someone at short notice for the TV segment. 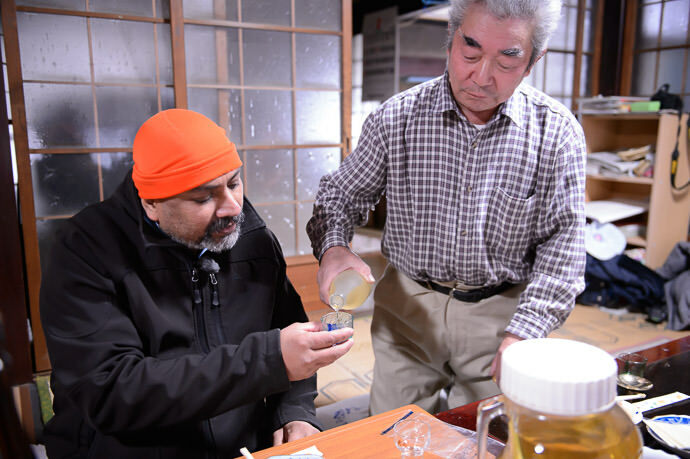 The presenter for the segment is radio/TV personality “Sunny”, a guy from India fluent in five languages (including English and Japanese). As he explains above, my impeccably-dressed friend Aeron readies himself to work the mochi mallet. 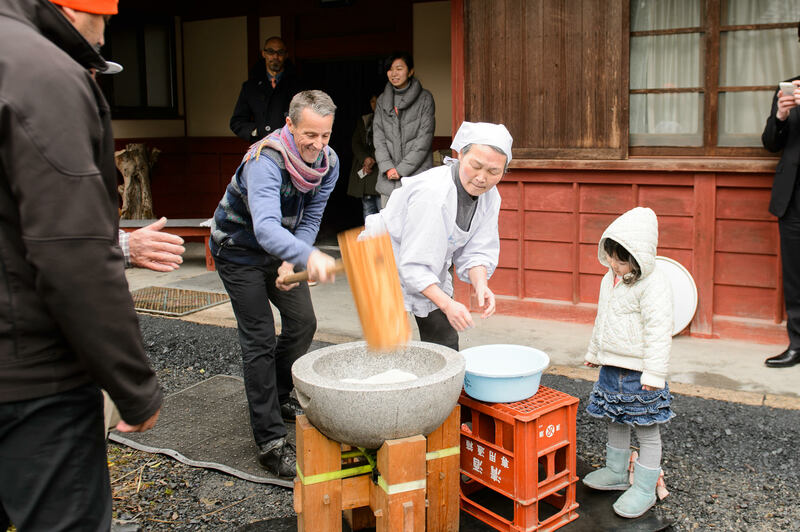 The guy with the white hat is a farmer who's been making mochi for 70 years, and the lady in the white smock is his wife (and the young child seen in some of the photos is their granddaughter). 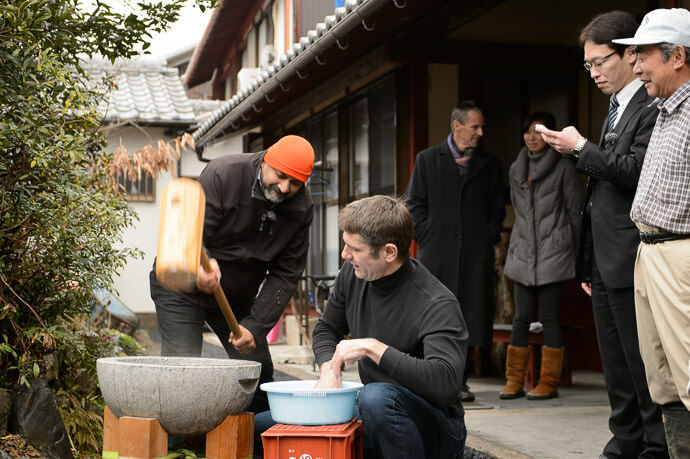 They host the mochi-making part of a tour at their home for the aforementioned tour company, and were gracious hosts for the TV segment on making mochi, which involves repeated pounding of cooked rice into a heavy, sticky, chewy paste. 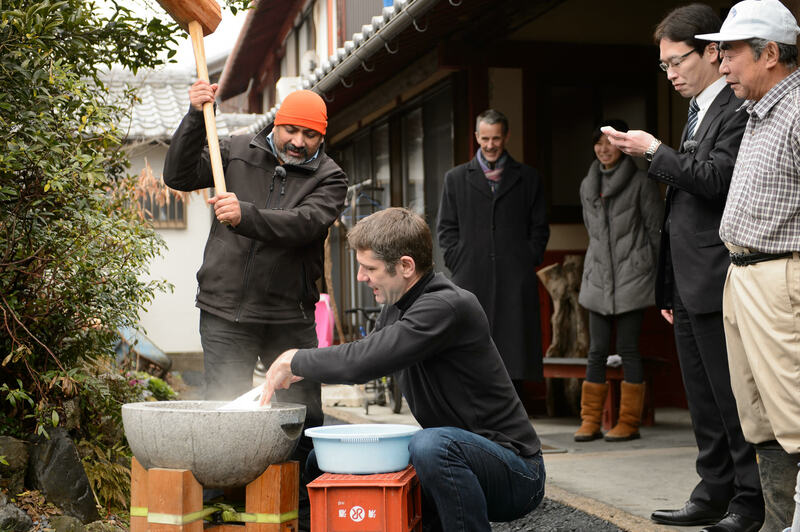 The rice is in an extremely heavy granite bowl. 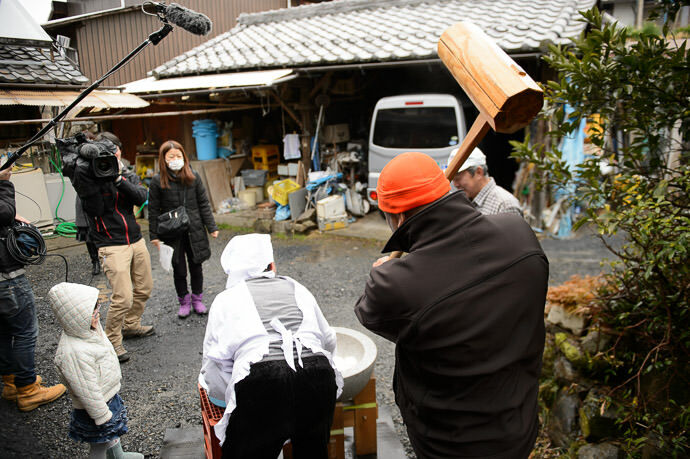 After each mallet blow, either a bit of water is added to the rice, or the rice is folded over on itself for the next blow. 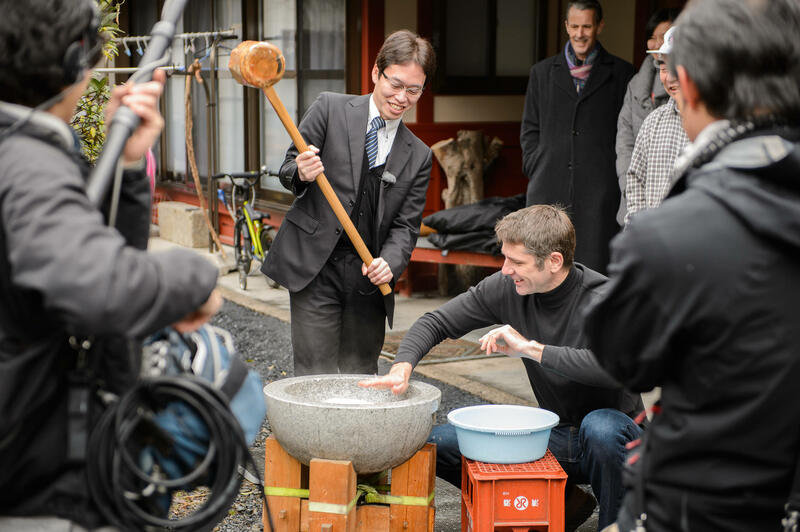 Each mallet blow was greeted with a great spray of watery rice, so black was not the best color to wear for the event. The poor guy's suit became speckled with white, but he took it all in stride, as did I in my speckled turtleneck. I then gave it a try with the mallet, though I don't have any photos of it. The farmer himself took the second position, and with each mallet blow he kept saying “faster”. I asked how many broken fingers he'd had over his 70 years, because I was worried about adding to the count with an ill-timed mallet blow. I shouldn't have doubted that he's a master... the answer was of course zero. So, we got into a pretty good cadence... maybe two blows every second, for what seemed like much longer than I'm sure it was. It's heavy work! That, combined with my visit to the gym later made for a well-earned outing that evening. 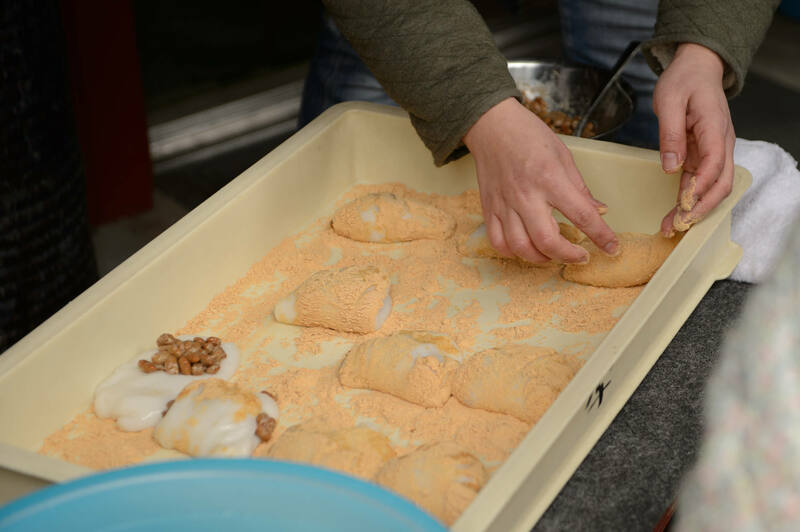 As is common with mochi, it's coated in kinako powder (crushed dried soybeans) to keep it from sticking to your hands when you hold it. 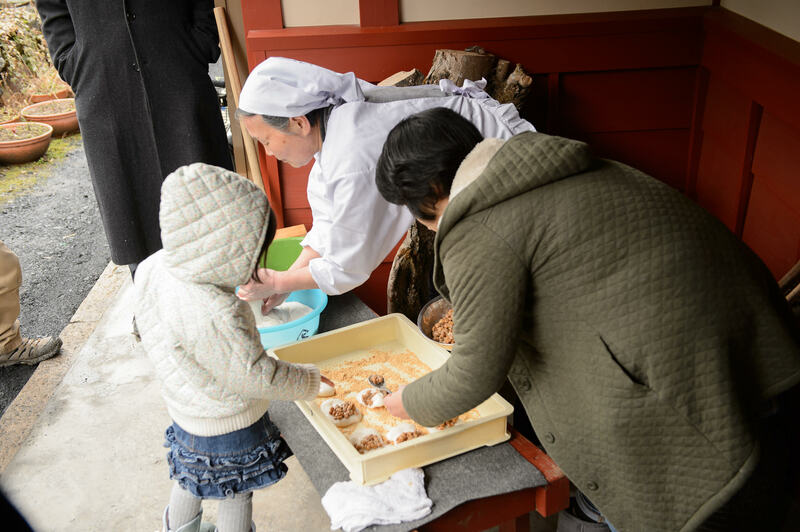 Mochi can be eaten plain or with various fillings, the most common being a sweet bean, but in this part of Shiga it's common to eat it with natto, fermented soybeans. Japanese people love to offer natto to foreigners just to see their reaction to the slimy texture and somewhat pungent aroma. I think the very presentation often prejudices the recipient against it. Personally I love natto, and when I offer it to someone for the first time I don't make any kind of fuss about it, to let them form their own opinion on its merits. More often than not they like it. Sunny doesn't care for natto but the rest of us enjoyed it. The farmer's wife had made it personally, along with the fantastically-tasty veggies we were given. It was all superb. The farmer himself had grown the rice the mochi was made from. Everything was fresh and healthful and exceedingly “local”. It was wonderful. I was a bit too late to catch the farmer offering a drink to Chris, so I asked them to recreate the moment for my camera, and in doing so Chris' cup was filled to the brim. 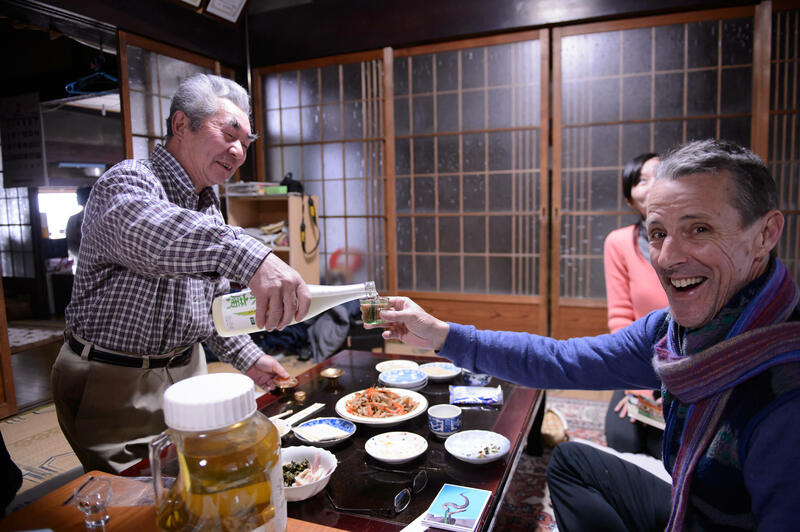 I thought it was just simple saké, which has the mild alcohol content of wine, but it turns out that it was some kind of 70-proof spirit made with a poisonous snake (that you can sort of see in the jar in the lower left of the shot above). Poor Chris was in a bit of a pickle with so much of the strong drink. I had driven my scooter to the event, so could not offer help in finishing it. We spent two hours for the filming, but it'll probably end up being just a few seconds on screen, or perhaps even zero if there's some big news event that day. We'll see next Tuesday. I was interviewed in Japanese... if any of that is shown, I'm sure I'll cringe at hearing my own voice, but it was a fun experience. 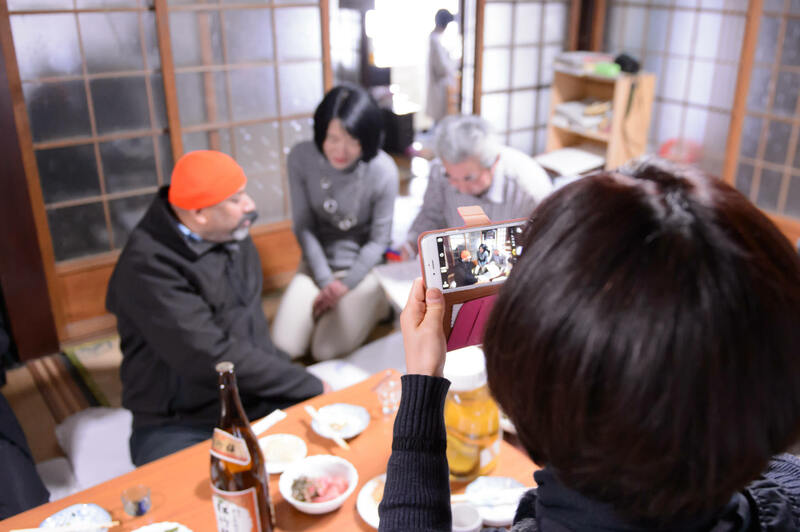 I think the experience also highlights a wonderful aspect of the Tour du Lac Biwa tours, that they bring you into people's actual homes and workshops for personal, intimate experiences not otherwise open to the general public. Being able to speak Japanese let me get the most out of each experience, but the tours are designed for non-Japanese-speaking (English-speaking) tourists, so they have an English-speaking tour conductor. But, as I'm sure is common around the world, a warm smile and a welcoming spirit need no translation. Any chance you can get a copy if you’re in the show and bring it along?? Where in shiga… used to live there (Maibara) many, many years ago?